Come spend an evening with your family at the movies! This is a FREE event! Space is Limited! 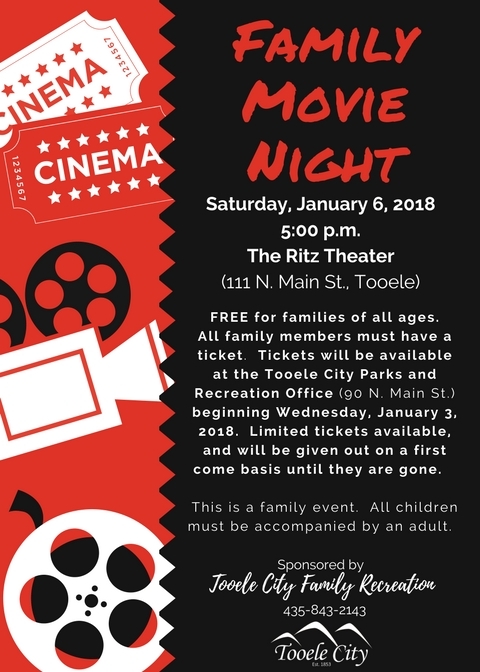 Tickets will be available at the Tooele City Parks and Recreation Office at City Hall (90 North Main Street, Tooele) beginning Wednesday, January 3, 2018. Pickup your tickets between January 3, 2018 – January 5, 2018 between the hours of 8:00 a.m. – 5:00 p.m.
Tickets will be given out on a first come basis until they are gone.